Mon/Wed/Sat: 8 a.m. to 6 p.m.; Tues: 8 a.m. to 12 p.m., 3 to 7 p.m.; Thurs/Fri: 8 a.m. to 8 p.m.; Sunday: 12 to 6 p.m.
Sweet T's Coffee, Beer & Wine is full of character. Founded in 2011, the cafe/bar/market hybrid offers more than a few twists. The cafe features specialty coffees, teas and smoothies, cheese, meats, breads and homemade baked goods. Behind the bar there are 5 rotating beers on draft. 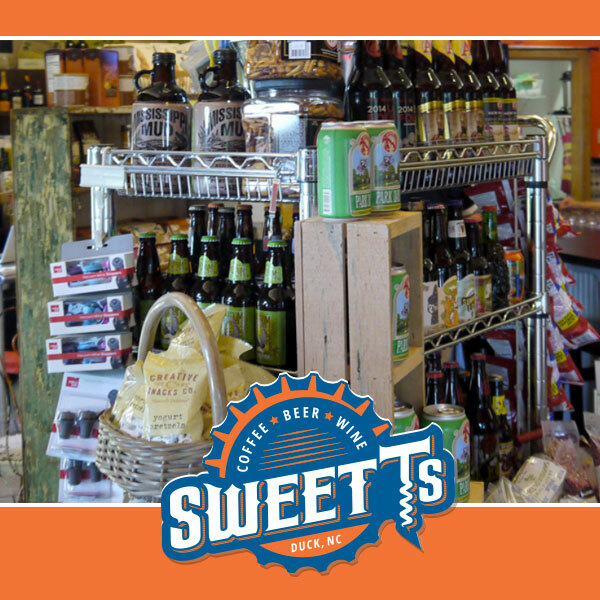 On the market side of the shop you’ll find novelty snacks and gifts, as well as over 200 bottled craft beers and more than 100 fine wines from around the world. No matter what your fix is, you can get it at Sweet T's. Sweet T considers her shop a conduit for camaraderie, and more than a few handfuls of locals would concur. “People have become friends here,” she says proudly. That's because she's created a space that can accommodate a wide-range of interests and attitudes. The atmosphere at Sweet T’s seems to have a supernatural knack for adapting to the moment. The shop is tight-knit inside, offering an ideal setting for cozy, coffee-sipping mornings, or for more spirited, beer-filled afternoons. Outside, it’s a whole ‘nother world! The deck is expansive, the seating is well-spread and all of it is shaded by a the resident oak tree. Point being: The living's easy here.